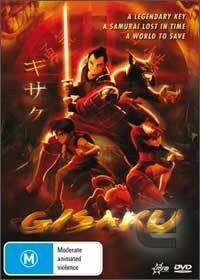 Gisaku is probably one of the best Japanese anime DVD's that I have seen in a long time which revolve around a group of warriors who have come together to prevent the Master of the Darkness from unleashing his demons upon the world of man. In order to prevent this catastrophe from occurring, Gisaku and his acquaintances (Riki, Yohei, Linceto and Moria) must first overcome their personal and internal conflicts in order to defeat them before they can engage in the final battle. Featuring stunning animation and one of the most intensive stories of the year, Gisaku is a tale of good versus evil that will keep you glued to the screen from start to finish. It should also be noted that the battles of Gisaku are gorgeously choreographed and will truly make you appreciate the artists behind this epic movie.